Will of Hatred is a new “symphonic” black metal band from Moscow, Russia. It is the solo project of Damiena, who is the leader and creator of this project, composes all songs, writes all lyrics and performs all the vocals. There is not much info about the biography of Will of Hatred, or when exactly was this project formed, so their debut album really came out of nowhere. It is entitled “Infinite Triumph’s Preface” and was released on February 25, 2015 via the Russian label MSR Productions. Including 6 songs with a total duration of only 22 minutes, “Infinite Triumph’s Preface” is something between a full-length and an EP. Like most Russian bands, Will of Hatred have a professional crystal clear sound! Their music is “labeled” as sympho-black metal, but I can’t say they are a typical example of the genre. They sound like a fusion of extreme progressive / heavy metal, technical death metal, symphonic black metal and even thrash metal. They have a very modern and technical sound, where guitars dominate their orchestrations and by the way Alexander Antycin does an amazing work as a session guitarist. Keyboards have an accompanying role most of the time and only in a few selected parts they get a more symphonic bombastic character. Damiena sings mostly with extreme growling vocals and she can really change her voice through many styles! She also sings with clean vocals, especially in the last song, revealing another (very interesting) face of hers. The compositions of the album move mostly in mid tempo rhythms, with only few faster parts and some slow passages. 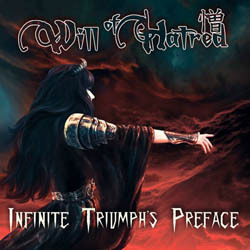 Despite the combination of various music styles, “Infinite Triumph’s Preface” has a common dark fantasy atmosphere, helped by the beautiful poetic lyrics, all written by Damiena in English. My favorite song of the album is the closing track “Flickering Wings“, a slow atmospheric dark rock / metal song, enriched by a symphonic background layer and some growling vocals. It is a quite unusual, but very atmospheric and really interesting effort! “Infinite Triumph’s Preface” is a promising debut album from a band whose music is really difficult to categorize. I find very positive and surprisingly impressive that they have found a very personal and original sound so early, with such a great production. I believe that many fans of extreme atmospheric metal might like them, so give them a listen and get their own verdict, since it is really hard to describe their music. Will of Hatred have a very good and technical sound and I hope they will present us something longer in the future. “Infinite Triumph’s Preface” is released by MSR Productions in a beautiful digipak edition with 16-page booklet. Each song is accompanied by a beautiful Gothic-style photo artwork, shot by Lena May “Tosch”, where the talented and beautiful Damiena is the model! The overall artwork and design is by Bathoriya and the result is more than appealing. You can visit the band’s official pages below for more details.